Juan-Jesús was probably about seven, though hard to tell. He’d been staring at me in the bar earlier, where I’d been chatting to a charming old guy about the provenance of the local jamón. The old fella had offered some useful tips about villages I should visit between Huelva and Extremadura. Obviously the child had spotted my accent, and seemed captivated by it. Later, while I grabbed some photos of Cortelazor’s 1,000-year old oak tree (the original meeting-place of the town council), I caught a flash of movement out of the corner of my eye, and there was Juanje again. Not every seven-year old British child could rattle off five facts about London, on demand. I was impressed. By this time we had reached the end of his street. I told him his English was excellent and he smiled with good eye-contact before waving goodbye and running down the cobbled slope. I carried on with my midnight stroll around the pretty village, vaguely wondering who “Weeso Turto” was. I was on a mini-roadtrip, fulfilling my new year’s resolution to explore more of Spain. Only three nights away, so I hadn’t gone far. 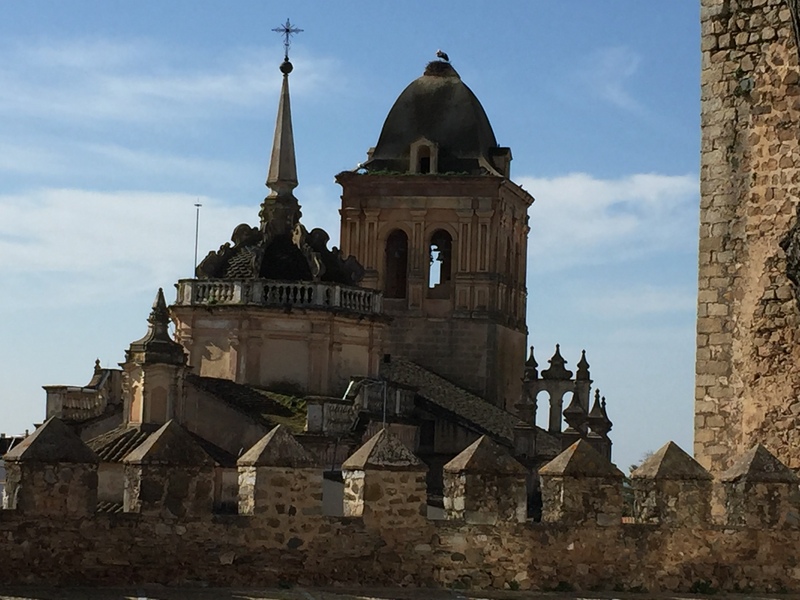 West past Sevilla into the province of Huelva to Aracena. My first overnight was chosen randomly, based on fabulously cute pictures of a rustic house in Cortelazor where the owner offered a room through Airbnb. A great choice, as I’d never have visited the village otherwise. It’s not famous, and I don’t think they see many tourists, so I was viewed with surprise and interest (but no suspicion or hostility). Strangers spoke to me spontaneously in the two bars where I spent the evening, one of my drinks was paid for by goodness-knows-who, and three locals gathered round to explain “la dehesa” to me as I tucked into a tapa of local jamón (and were appropriately impressed when I already understood dehesa and had spent a day on one! 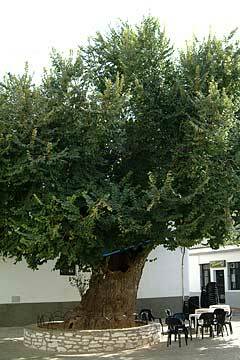 122 – Of Acorns, Olives, and Old-Andaluz). Between them, they mapped out my route for the following day. One got very excited and shouted that I simply MUST go to Jerez de los Caballeros. He looked quite crest-fallen when I said that my friend Lola had already put that on my “must-do” list. Both Lola and the stranger in the Cortelazor bar were right. Jerez de los Caballeros is a simply stunning village. An excess of towers, spires, beautiful old buildings, and a plethora of huge storks’ nests cropping out from the high points, made this a high-point of the whole trip. Then on to Zafra. As Lola and Pilar and Susana had all told me, it’s very difficult to eat badly in Zafra! The dehesa land all around the region provides not only the Iberian pigs for jamón, but also free-range (happy!) cows and sheep. 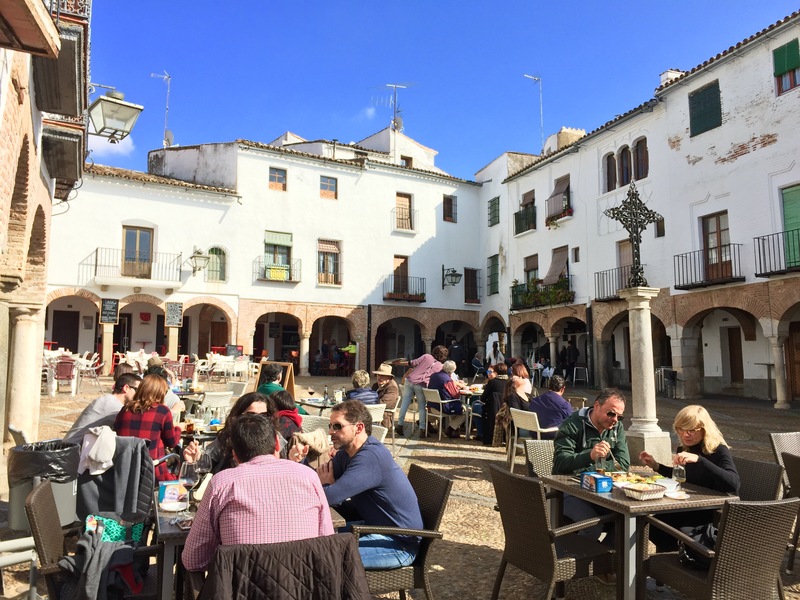 The local speciality is “carne de retinto”, free-range beef from red-haired cows, which I tried in a cute bar in the corner of Zafra’s Plaza Chica (“little square”). With two nights in Zafra, I was able to head north on the straightest road I’d ever been on (the speedometer kept creeping upwards and I was constantly having to reduce my speed on this long, empty Roman road). 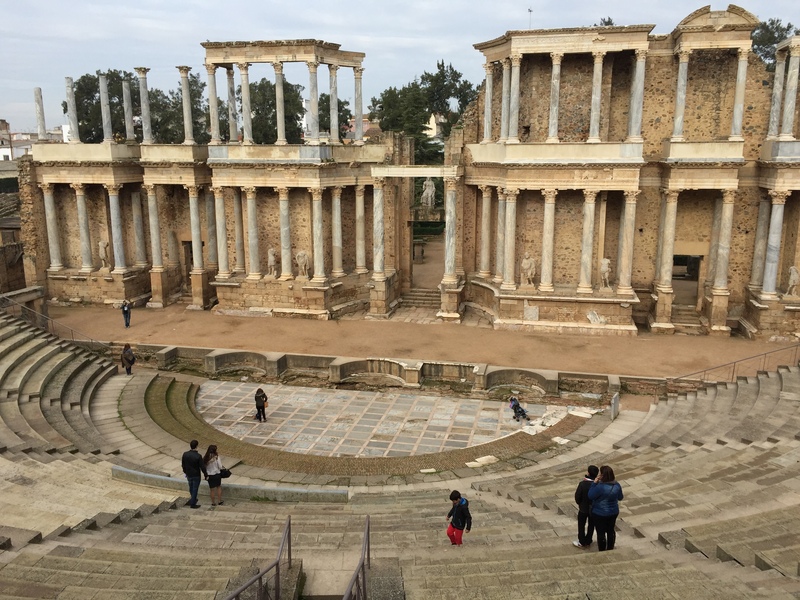 The destination was Mérida, where there are purportedly more Roman ruins than anywhere outside Rome. A touristy town, understandably, so it was useful that my friend Leticia had given me a recommendation of an excellent non-touristy restaurant. Back in Zafra I was torn between trying yet another of the magnificent bars and restaurants, but in the end the lure of Manuel’s cheese croquetas was too strong and I returned to the little backstreet bar that I’d found the night before. I was greeted as a regular (after one visit!) and Manuel grabbed a map to help guide me on the following day’s drive. 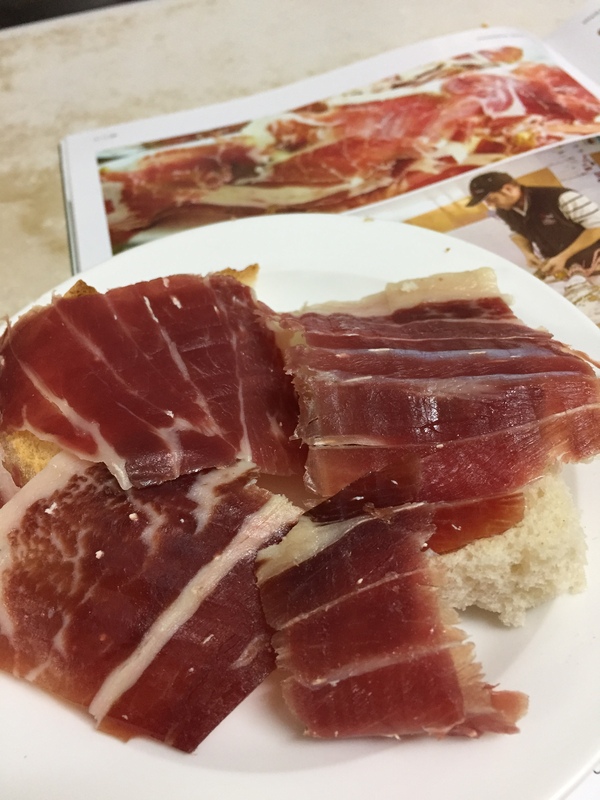 He recommended more local villages – Jabugo, where the altitude and the wind provide a particular method of drying the pata negra hams to make particular fine jamón. Llerena. Cazalla de la Sierra. He too was impressed that I’d already visited Jabugo on my route out of Cortelazor, so pushed me towards the other two. I’m always happy to accept random advice! Sometimes it works out really well, and if not, well, I always like to stop somewhere for a coffee. The whole trip was made infinitely better by the detailed guidance of some Spanish friends and a couple of foodie British friends. They are already helping plan my next escapada. While I was driving I heard on Spanish radio that the King’s sister the Infanta Cristina and her husband Iñaki Urdangarin would be sentenced in half an hour for their part in the caso Nóos corruption trial. I timed it perfectly and stopped in a bar in Llerena to watch the news. At a minute to eleven the bar suddenly filled, as all the Spaniards from the street piled in to see the sentencing. His was announced first – six years and three months. There was quiet muttering in the bar (“pffff, no es suficiente”). Then hers. Nothing. Her claim that she had seen nothing, heard nothing, done nothing, was accepted. One old man spat at the telly and pushed his way out. The rest seemed more resigned, rather as though they had expected this verdict. “Una ley pa’ellos, otra pa’ nosotros” (one law for them, another for us). And people wonder why there is so little respect for powerful people. “The price of greatness is responsibility,” as somebody said. This “golden couple”, privileged, royal, rich, were greedy for more, and irresponsible with their power. Who was it said that? I pondered as I walked back to the car. Ah yes – Winston Churchill. And in that moment another puzzle was answered. “Weeso Turto he born London” Juanje had told me proudly three days ago. Take into account the Spanish difficulty in ending words, putting a “t” in the middle, or sounding a “ch”, and there you have it. Weeso Turto = Winston Churchill. This entry was posted in Spain and tagged dehesa, jamón, Merida, Spain, Zafra by tamaraessex. Bookmark the permalink. I always enjoy your blogs Tamara thanks. I enjoyed that blog Tamara. Brave woman setting off to keep your new year resolutions. do something like that but am too fearful of getting lost. Enjoy yourself. Thanks Mary! No, not fluent (give me another 20 years for that haha!) but competent and confident enough. As for the navigating, well I’m not sure it would have been so easy without a satnav! Plus lots of useful friends who know the area and made fabulous suggestions. Lola was born nearby and her family still lives there, so that was useful! Spain is my favourite place. But I don’t mean the Costas. I mean the undiscovered inland areas where no tourist goes. I love the culture and the food and hope to retire there one day.